We have also started to plan the numerous festive events that will be happening in school amongst our learning between now and the end of term. The Christmas activity dates are listed below � further details will be sent out over the next few weeks and will be posted on the school website. On behalf of the children, staff and governors, I would like to welcome you to Thorney Close Primary School. Our school is set in spacious grounds, close to the Durham Road, one of the main transport routes into Sunderland. 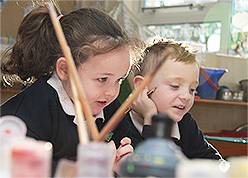 Visitors to our school comment positively on our size and space, our facilities and the stimulating environment. They describe our atmosphere as calm and nurturing. All classes are referred to by the name of a tree. The trees link nicely to our school logo of a tree and the school motto, �Where Learning Blossoms�. Click here to find out more about each class. The Travelling Book Company will be in school between Monday 29th April 2019 � Friday 3rd May 2019 with hundreds of new children�s books to browse and buy. Travelling Books offer a fantastic deal where all books are 3 for the price of 2.